• 102 sqm , 3 bath , 2 bdrm 2 storey – FOR SALE €155,000. NOW €135,000 EUR. This impressive 2 bedroom semi-detached villa is situated on a quiet luxury complex in the popular area of Peyia. There are a wide range of amenities nearby and the coast is a few minute’s drive away. The property is in immaculate condition and maintained by the current owners to an exceptional standard. It’s light and spacious throughout with good quality finishes and the design is wonderfully quirky. The ground floor accommodation features an entrance foyer with fitted storage cupboard, guest cloakroom and open plan living room with stylish modern kitchen. The kitchen is well equipped with white fitted units, black granite worktops. Appliances include built-in oven, electric hob and extractor fan, microwave, fridge/freezer and washing machine. A mobile island provides further fitted cupboards and additional worktop space and can be re-positioned easily if required. A marble staircase leads up to the first floor and two double size bedrooms with fitted wardrobes, en-suite facilities and private balconies with gorgeous mountain views. Sliding patio doors in the living area open on to a private courtyard garden – perfect for enjoying the wonderful outdoor life. Features include an outdoor grill, seating/relaxation space, covered dining area and a retractable awning provides additional shade when required. 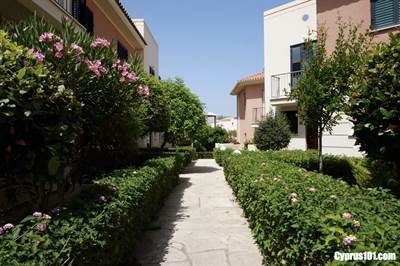 From here, a gate leads to one of the two complexes’ semi circular shaped swimming pools and the second larger pool is accessed via a pathway bordered by beautifully landscaped gardens. This property comes fully furnished and is ideal as a holiday home/rental investment. There are full title deeds.